Wow its hard to believe we have had Belle a little over two months. I wasn’t sure what to expect since we have never owned a mare. Like everyone else we have heard the horror stories about mares . They are crazy! They are Hormonal ! They are Moody! They are Dangerous! When Belle arrived she was on a Hormone replacement Regimate that kept her from going into heat. The product is expensive and can be dangerous to female owners if touched. However, it works great at keeping mares calm and even by blocking their cycle. I have no issues with people using these products. I for one could not afford to keep her on it all the time and I also prefer to avoid giving things that may or may not be needed all the time. I’m more of a naturalist and believe that less is better for both humans and animals. Now, we have had her through two heat cycles and yes she is a bit distracted and flirty. Right now this is not a problem but come show time, it is possible this maybe be an issue. She also kicks in her stall when she wants out or attention. However, this could be to the difference in schedules and once she gets in to a routine this may lessen. Even with the banging around, once you enter the stall she stops and if you take her out she walks calm and relaxed. It’s purely attention seeking. Other then those two things Belle is so sweet and willing to learn. She’s not afraid of anything that we can tell. She has been up rooted from her cool green home in Michigan and dropped in what must be hell to her here in Arizona’s barren desert in extreme heat.. She has been exposed to lots of strangers, welding fences, sheep and other sounds that are probably strange to her. Through all of it she has not batted an eye. She just waits for direction and appears to go with the flow. I’m so happy with Belle and know she is going to be the perfect horse for Briar. I’m just amazed that I almost passed up on Belle because she was a Mare. I think we need to stop passing around so many horror stories about Mares and start focusing on their good traits. I’m sure some of the stories are true and Mares can be difficult. It’s just the way the female body works! Although ,with good health, proactive owners/trainers Mares can be just as rewarding as Geldings. I’m curious what other Mare owners think? Do you keep them on hormone treatments 24/7 or just during shows? If you use replacement therapies are they natural or synthetic? What works best for you? This entry was posted in Belle and tagged APHA, AQHA, Crazy Mares, Hormone Replacement for Horses, Horses, Love Mares Horses, Mares, Paint, Pinto. 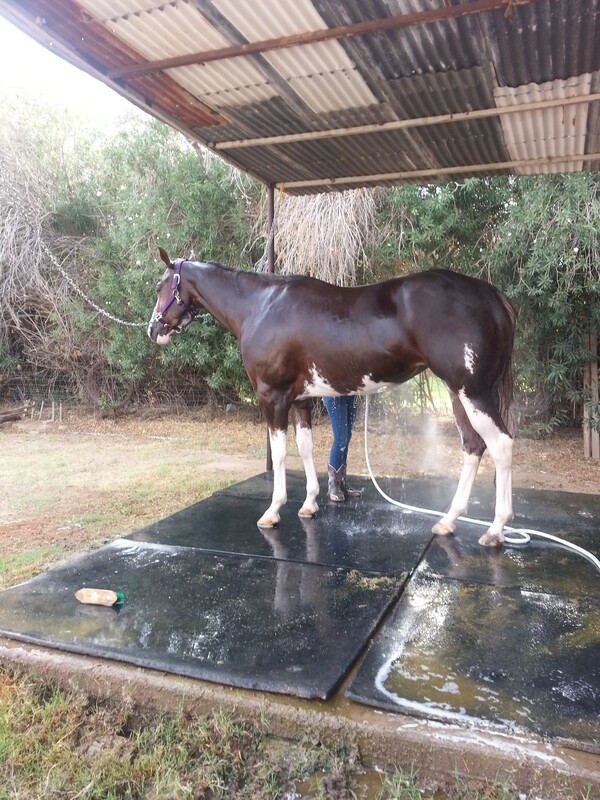 This entry was posted in Belle and tagged APHA, AQHA, Belle, Equine, Equine Bath, Horses, Paint Horses. As we all know Paints don’t have the greatest of hooves and Bingo is no exception. He goes through these cycles where some summers his hooves are strong and healthy. Then out of nowhere they become soft and brittle. It’s strange to look at, they are dry and cracking on top and soft and mushy on bottom. Bingo is not turned out during irrigation nor stands in a wet stall for any period of time. We bathe him weekly and rinse him off after riding. We also use tuff stuff once a week to help repel water. It’s like a weird genetic kinda of thing or that’s what we think. During these cycles he becomes difficult to shoe, either he loses a shoe or the challenge becomes finding a sturdy place to put a nail in to hold the shoe on. I’ve also noticed during these cycles he grows a small coat, which in Arizona most horses shed out quickly in 102+ temps. I guess it’s my fault in a way, because normally I keep him on Hoof Rite and it seemed to stretch these cycles making them less often. Of course, I bought another great supplement that had everything in it, including a hoof supplement so I took him off. Not because of the expense, because I thought if he didn’t need it then why put that through his kidneys. I’m more of a naturalist by heart and try and avoid stuff unnecessary in hopes of keeping him healthier. So , Yesterday my Farrier came out and we determined he was going through this again. 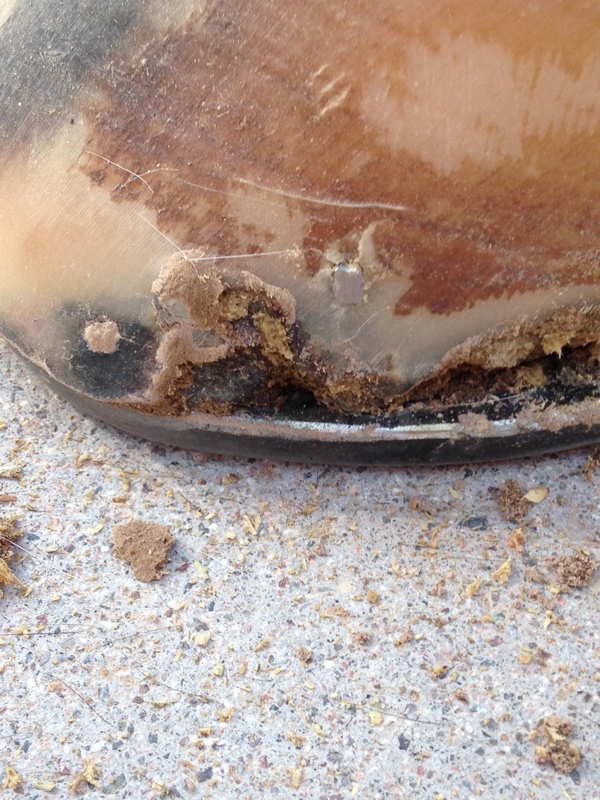 Shoeing was a challenge so based on this, I plan on adding Hoof Rite back into his diet and leaving well enough alone. I’m curious if any of you have experienced this? Have you determined what’s causing it? or what supplements work for you? I would love to hear your thoughts on this subject! 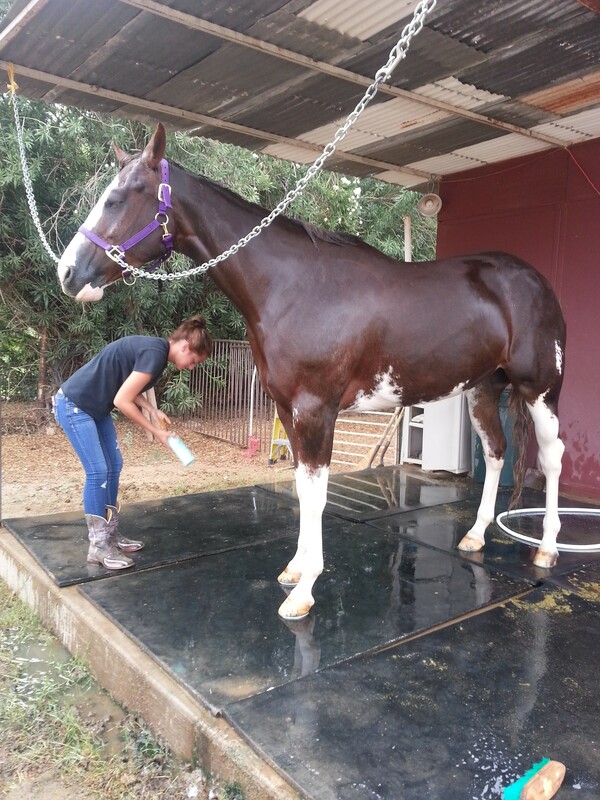 This entry was posted in Bingo and tagged APHA, AQHA, Bingo, Farrier Services, Hoof Problems, Horses, Horseshoe. 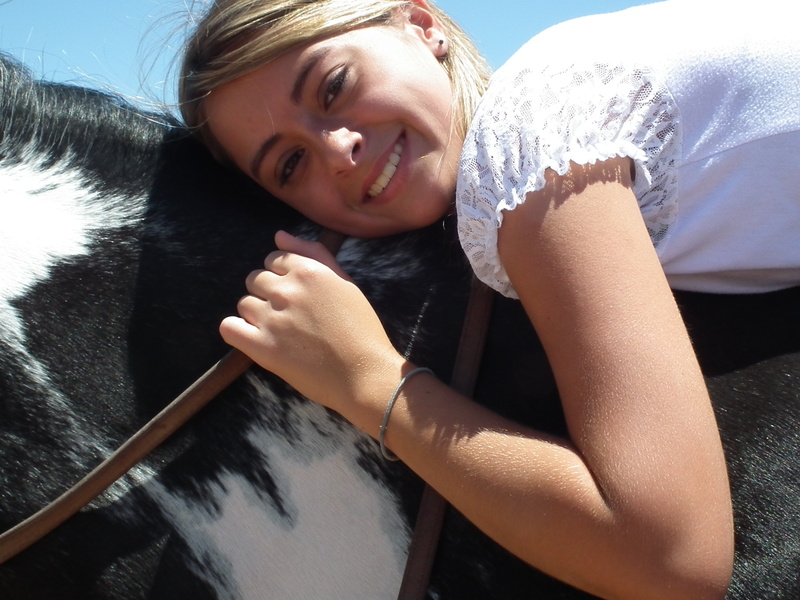 I LOVE HORSES DAY! It is one of their favorite “unofficial” holidays. This day pays tribute to, and honors, the horse. This entry was posted in Horse Sense and tagged APHA, AQHA, Honor Horses, Horses, I love Horses Day, Pinto. I’ll never forget when Briar came to me and asked to quit dance. She was dancing competitively since age 4 and at age six she was dancing 4 nights a week for about 3hrs each night. She would then have events or competitions on the weekend our during the week. We lived and breathed dance, it was a wonderful experience that had finally come to an end. She was burned out and wanted to try something else. So she said Horses! Well, I knew nothing about horses, nothing! But, I thought it must be cheaper then dance and I would regain some “me” time. So, I went on this search for horseback riding lessons. I went through many trainers. But, that experience lead us to competitions and ownership. Now we live and breath horses. I have a little more “me” time but I actually gained a lot more quality time with Briar and we love every minute of it. Horseback riding is so much more then the act of riding. Riding provides exercise and freedom that only a rider can understand. It gives the child a sense of power that translates into self confidence. It puts them in control of a part of their life that helps them solve problems and release pre-teen frustrations. Anyone who rides will tell you it takes self control, perseverance, patience, problem solving skills ,strength and a will to never give up, because horses have a mind of their own and training them takes skill. Horse shows provide another set of skills. They learn to prepare and care for the horses during the shows. They learn to socialize with others and create lasting friendships. They learn what constructive criticism is and what not so constructive criticism feels like. But, that’s okay, because they learn life is not always fair. They learn how to present themselves and be judged. This kind of exposure creates well rounded, talented, hardworking, strong kids that understand there is more to the world then just themselves. It can be a dangerous sport, but all sports have their risks. With proper training and the use of safety equipment it is safe and rewarding. I encourage everyone to at least ride once and get a glimpse of that freedom. Please share your thoughts on kids and riding or what you love about riding. This entry was posted in Horse Sense and tagged Horseback Riding, Horses, I love Horses, Kids and Horses, Learn to Ride Horses, Paint Horses, Quarter Horses, Teens and Horses. So, I heard about the swirl from one of my daughters trainers about a year ago. She told me that our horse Bingo had a great personality and was a genital soul with above average intelligence based off this swirl. I thought she was making this up, so I would feel comfortable around Bingo. I did not realize there was so much information on this subject. It not only gives you a look into a horses personality it also tells you if they are left hoof or right hoof. Giving you an opportunity to maximize their potential. Here is a detail article written by Charlotte Cannon at Foxpointfarm.com. It is incredible the depth of information provided and a how well written the article is. Enjoy!!! From the most ancient times, man has studied the world around him for signs and clues. Horses have been a huge fascination since 30,000 BC when they were first drawn on the walls of caves. Ancient students of the horse may have studied things and made conclusions that we find foolish today. But as with everything that is old and becomes new again, the study of swirls, although rarely shared insights, experiences and knowledge, has always has had its believers. Here we will uncover some of the ideas and help you better understand how they work and influence who and what your horse is and who and what he may become. This entry was posted in Horse Sense and tagged Bingo, Horseman, Horsemanship, Horses, Study of Horses, Swirlology. I know I have gotten several questions about it in the past week so here is a re-post of my firework safety and horses post from a few year back. I hope you all still find it relevant. Have a safe and happy holiday everyone!!! Happy 4th of July to all my fellow Americans out there! For all my international readers who are not familiar with the holiday the 4th of July is a holiday that is supposed to celebrate the creation of our country. For some reason in order to do this we have BBQ’s and watch fireworks. And since horses and fireworks tend not to be a match made in heaven I thought it was a good topic for a post. For many years I have worked a several different horse farms. I have always loved doing the night turnout shift in the summers. This means that I am in charge when the big booms start to happen so if injury occurs it is on my head. So of course being the responsible barn worker that I am I did a lot of research on this topic and I am going to share it with you. 1) Know your horses and where they feel the most comfortable. Some horses are not very spooky and don’t tend to be bothered by loud noises. My Genny, for example, does not get upset when he is turned out during a thunderstorm. He is perfectly content outside as the thunder cracks, but if he is in his stall during a storm he gets upset. Therefor my horse is better off outside (assuming the area is safe) during the 4th of July. Which he has been with no issues. He turned to face the boom, and when it first starts he will keep his head up, but Genny is just not the kind of horse to get upset by fireworks. The owner’s mare on the other hand is very sensitive to noises. If a thunderstorm is coming and you can hear the rumbling in the distance you can put money on the fact that the mare is tearing around her field in a state of panic. She is much calmer inside. Safety always come first so if one location if putting them in harms way you have to do the other, regardless of where your horses feel the most comfortable. Now keep in mind that this is where your HORSE feels most comfortable, not where you want them to be comfortable. If you want to have them in the barn because it makes you feel better, yet the horses are calmer outside just remind yourself that you are trying to keep them in the least stressful situation. 2) Know your neighbors. In both the farm I was working, and now the one where Gen lives now the neighbors see the openness of the pasture as a good place to aim the fireworks. So they aim the fireworks away from their homes and towards the horses. Therefor putting the horses outside is not an option because they might physically get hit with a firework. It is a good idea to pop over to say “hi” to your neighbors who set off fireworks on the 4th earlier in the day (preferably with a bottle of cheap wine as a gift for them) and just ask them when the fireworks are supposed to start and how long they think the show is going to last. 3) Be aware of your horses surroundings. Take the time today to check all the fence lines and door latches. Try and smooth out any rough terrain if you can and make sure that if your horses are inside that they have plenty of hay to try and distract them from the bombs going off outside. Also don’t forget to walk the field the day after and remove any of the debris from the fireworks. 4) Have sedatives around if necessary. There are TONS of herbal sedatives around like “Total Calm and Focus” and “Quietex” as well as veterinary prescribed sedatives that might be a good idea to keep on hand. As the farm owner you just want to take the edge off a sensitive horse so they don’t injure themselves. There are horror stories like this all over. Most sedatives take a little time to set in so if you think your horse might have an issue and you are concerned I personally feel that you should give them a single dose of a mild sedative as per the instructions on the package which can sometimes be hours before the fireworks display. It really depends on the horse, I know that Genny does not need a sedative. 5) If possible, buy a radio for the horses and leave it on playing relatively loud music. You don’t want to hurt the horses ear drums, but a radio that is on loud enough for you to sing along to it can help distract the horses from the big booms that are going off around them. If your horses are more comfortable outside and in no danger from being there it might not be a bad idea to leave the car with the radio on and the windows open in the driveway near their fields for the duration of the fireworks display. If your horses are going to stay in a barn radio can be purchased for cheap and left in the barn even after the 4th. 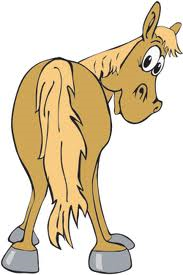 6) Desensitize all year if your horse really has a problem. Obviously, it is a little late in the game to be desensitizing for tonight if you are just reading this post now. This is something to keep in mind for next year. Police horses are trained thoroughly, and one of their training areas is fireworks and bombs. They start them small when it comes to getting used to loud bangs, like popping balloons, and work there way up so the horse does not bat an eye when they are out in a riot and people are throwing fireworks around. 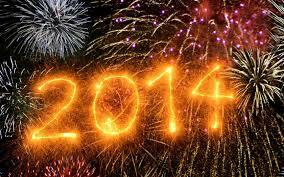 So what should you do with horse if you know they are going to have a fireworks display near by? Know where they feel the safest and keep them there as long as it is safe, know what time the display might start, keep your fields and stalls as danger free as possible, if necessary do not feel bad about giving a sedative to help keep them from hurting themselves, get a radio or some other form of background noise so the booms are not as prominent, and try and get your horse a little more comfortable year round with loud banging sounds so the 4th of July doesn’t seem like Armageddon to them. I hope these tips helped and stay safe everyone! This entry was posted in Horse Sense and tagged Fireworks, Horse and Fireworks, Horses, Paint Horses, Pinto Horses, Quarter Horses, Teens and Horses.